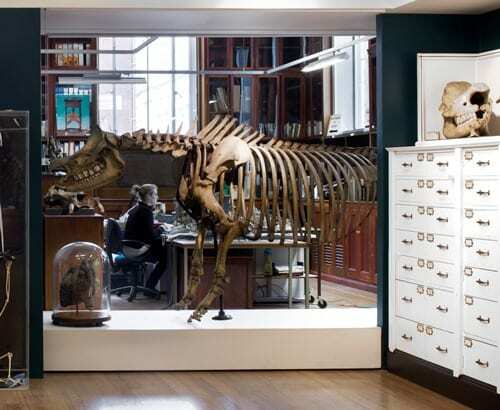 The Bone Idols project seeks to significantly prolong the “shelf-lives” of our specimens so we can continue to use them, as we do today, in teaching, research and public engagement. 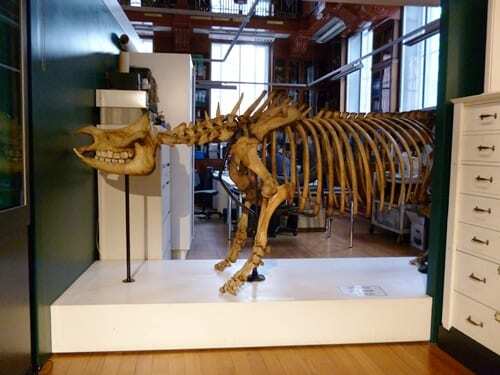 The rhino skeleton came to the Museum as loose bones in 1911 from the “University South Kensington collection” also referred to as the University of London Loan Collection, and was mounted on an iron frame, along with three other big skeletons, for the bargain price of £14. It would be easy to say “you get what you pay for”, but that might be unfair as the ironmongery skills used were impressive, and that rarely overlaps with training in skeletal anatomy. The primary goals of Reg’s makeover were to clean the skeleton of the nasty grime that coated him, built up after 104 years on open display, much of which was spent in a room lit by oil lamps; and to stabilise his mount to be less precarious. At the same time we would reposition him so he was actually rhino-shaped. The first thing I said when the doors to the van opened and I saw Reg was “it’s a completely different colour!” Before, Reg was off-white, as you might expect bone to be. This was actually dust and dirt. Now Reg is the woody brown colour of old bone. Rhinos spines curve downwards from the hips to the shoulders, and then down again along the neck. The “old” rhino’s spine was ruler-straight and parallel with the floor, before a neck that pointed up. The shoulders are now lower than the hips, and the head lower still, but we found that we couldn’t introduce a natural curve along the spine. The bones of the spine and pelvis were actually more solidly attached than we realised. We thought that they were simply held in place by a single iron rod running through the neural arch of the vertebrae (the space for the spinal chord). In fact, not only was that rod fixed by a strong resin, but a thinner rod had been drilled and glued through the main body (centrum) of each vertebra and through the pelvis, making it immovable. The rhino being reassembled – the new position has the hips higher than the shoulders, with the neck angled down. We faced the decision of whether to cut the pelivis free and force the two rods out of each vertebra. The alternative was to keep an unnaturally straight spine. In the end the risk to the specimen was too high, and we left the rods in place. Although its back is still straight, the hips have been raised and the shoulders dropped, so an overall accurate shape has been achieved without damaging the bones. The neck now points downwards, as it should, and an extra upright support is holding its heavy skull in space, adding a great deal of stability. 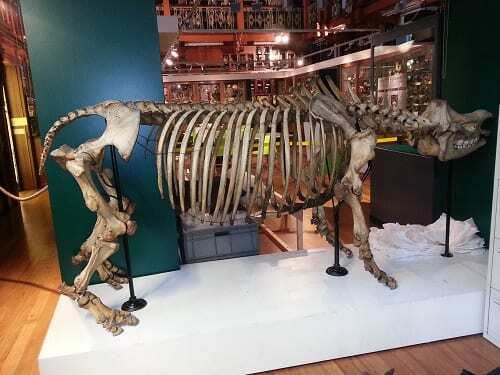 The “old” rhino’s legs did not fit into its pelvis – they floated freely in the air, disassociated from the body. Not only that, but the head of one femur was not on the skeleton. Normally, the tips of bones (the “growth plates” or epiphyses) fuse to the bone shafts during an animal’s adolescence. The rhino is definitely adult, so we were surprised that the femurs had not fused. Apparently this does happen with large mammals like rhinos and elephants. The epiphysis has been reattached, and the legs’ supports shortened and reshaped to allow them to sit in properly the sockets. The legs all now touch the ground, which they didn’t before. Not only does this add a lot of stability, it doesn’t imply that rhinos could fly. When the grime was cleaned off, it turned out that one of of its lower incisor “tusks” was made of wood, as were both upper incisors. 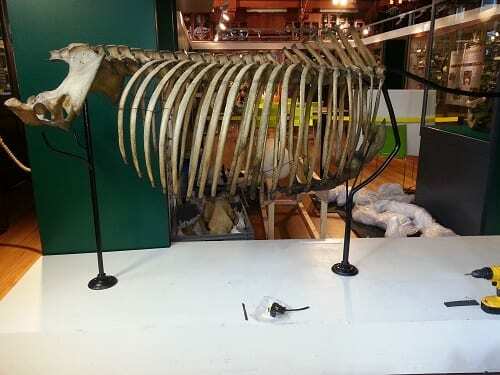 The conservator, Nigel Larkin, found evidence of the rhino’s last meal among its teeth – some grassy leaves. Inside its nose was a mass of insect larvae casings. This isn’t unusual in museum specimens – household insect pests like clothes moths and carpet beetles regularly eat soft tissue on museum specimens. However, a Twitter investigation identfied them as rhino bot fly – a rare parasite of live rhinos. Do come and visit the spruced-up Reg, and please do support the Bone Idols campaign by donating online – we have a lot more work to do.